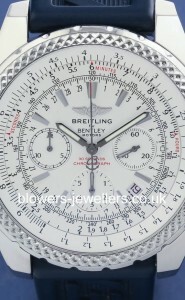 The relationship between Breitling and the English car marque Bentley began in 2002, when Bentley’s high-performance Continental GT featured a Breitling branded clock on its dashboard. 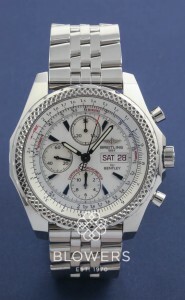 The following year, Breitling released its Breitling for Bentley range. 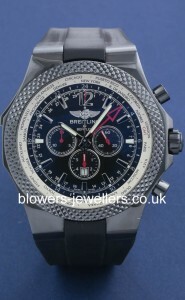 Breitling sponsored Team Bentley and in 2003 saw the dual-branded racing car achieve podium glory at Le Mans. Where many of Breitling’s models have historically enjoyed links with aviation, the Breitling for Bentley models clearly reference the automotive world and draw on the car marque’s illustrious racing history. 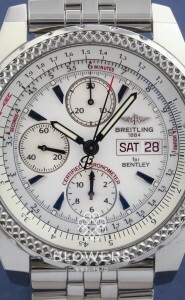 Over the years the Breitling for Bentley collection has included GMTs, perpetual calendars and even tourbillons. However, the chronograph will probably remain the most applicable complication for the dual-branded watches, successfully fusing speed with a need to accurately record elapsed times. 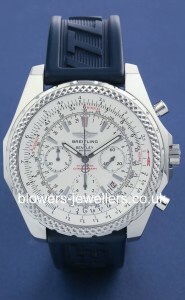 Browse pre-owned Breitling Bentley watches in used and unused condition below.